Kalima: Speaker; Mouthpiece (Arabic); “The formal declaration of faith” in Islam. We prepared as much as we knew how to. My partner and I are community organizers, and we know how to plan! We know how to put together outlines and benchmarks and work lists, etc. We had binders of research, and tracking forms, and food and exercise plans. We documented midwife visits, came with questions, did acupuncture, took the herbs, went to birth education class. And yet, the only thing we were pretty sure about was that we weren’t really sure what we were doing. Even with all the support, love, and care from Marea, our midwife, there was really no way we could have prepared for this beautiful chaos. The process was hard. I had had a miscarriage in 2017 and when I got pregnant six months later, I was afraid to be excited. My partner and I went to the hospital the first time around for an intrauterine insemination (IUI) procedure, and when we went back the second time around they were no longer doing IUI’s. We were totally heartbroken because we thought that that was our only option. We sort of stumbled upon midwifery, did our research and called one midwife and asked her a series of questions and then decided to work with her for the the IUI procedure. We were shocked at how different the experience was and how grounded we both felt during the process. When we found out that I was pregnant, we immediately called our midwife, who then talked to us about home birth and invited us to a movie screening and roundtable discussion. We decided to “entertain” this idea, but were definitely not sold until we watched The Business of Being Born and talk to other midwives, doulas, and pregnant women at the screening. We both agreed that night that we felt we could provide the space in our home to bring the baby into the world the way we wanted — in a calm, warm, musical environment. After deciding to work with a midwife and have a home birth, our midwife informed us that she too was pregnant. So, she referred us to Marea Goodman, whom we grew to love very much. Marea held space for our family to go through this process in such an incredible way. She not only provided the knowledge and medical support that we needed, but she did it in a way that was thoughtful and caring. She upheld our rights when we hadn’t even realized that we had had experiences in healthcare that were both humiliating and traumatizing. Marea treated us with dignity and supported us through worry and fear. Our family is eternally grateful for the love that Marea helped bring into our lives. This was the most intense “moment” of my life. What I remember now, four months later, are shades of memories. I am reminded of the time we spent in our beloved space at home, so carefully arranged so that we might bring life into it. The lights are dim and my partner is looking deeply into my eyes, waiting for me to tell her what to do, how to help. But, I gaze back at her and without words she knows that her presence and the ways she is squeezing my hips is enough. I look at her and think, “everything is about to change my love.” The words won’t come out, but we both know the moment is upon us. My last day of work was Wednesday; I remember I also had a meeting that evening. I checked in about how excited we were and how nervous I was to have 2 weeks off before the baby would be here. But she had her own plans. That night I woke up to contractions. I felt a little sick and felt sweaty while going through each one. By the morning I was only experiencing some tightening, so thought whatever it was, had passed. I drove my partner to work in the morning and went home. I started to have more contractions, so tried to get in touch with Marea to see if it would be okay to go to get acupuncture. I went to see Marea that evening and she confirmed that I was in early labor. We went to eat and then went home. That night the contractions intensified, coming every 6 minutes. With each surge, I felt more empowered to get our baby here. I felt ready and aware of all that was around me - every ancestor and every candle lit for the welcoming of our little one. Around 3:00am, the contractions started to spread out to every 8 minutes, and then increased in time to every 20 minutes by 7:00am. I felt disappointed and tired. The next day was difficult. My best friend and partner stayed with me in our bedroom. I remember the smell of mom cooking spaghetti in the kitchen and the sounds of Jeanelle and Nikki sitting on the bed talking about how the night had gone. I hadn’t slept more than 20 minutes at a time the night before, so Nikki went to get me Benadryl so that I’d be able to get some shut eye. I buried my face in the pillow and felt comforted by Nikki’s lingering smell. 4:00PM approaches and by now I’m getting scared. The contractions are starting to get closer together and it makes my heart beat faster. All of sudden I’m overwhelmed by fear. I’m afraid that I won’t be able to do this, so I tell Nikki to call Marea and tell her I want to go to the hospital. Marea gets on the phone and talks me down and says that she’s going to come over. I pray that she will get to the house soon, and help me. I can barely keep half a banana and a bite of spaghetti down as the contractions start to get closer together. They have stayed at 8 minutes apart for hours and hours. I’m so exhausted and now Nikki and Jeanelle are talking about putting on Star Wars. I stand next to the bed so that I can watch too — but the surges are just too strong. I can’t concentrate on anything but the baby. Marea comes behind me and rubs my back and gives me water. Hours have passed and the lights have been dimmed. I look up and see the prayer flag that my community has given us. I look around at the confirmations that Nikki and I have written: “God is with us.” I rock on my bouncy ball, head in Nikki’s arms, thinking about the women that we met in the Philippines, who gave birth in grave conditions, women who were taken from their babies when they became political prisoners, women who died giving birth at checkpoints. I lift my eyes to the sky and breathe. In this moment I’m overwhelmed. I feel like my heart is going to fall out of my chest. I pray that my own mother and mother figures in my life know the love we share. I feel their life in my veins. I climb into the water, but am too exhausted to keep myself up. I stay there, laying back in the water to rest, and come up to the side, embracing each surge as it prepares me to bring forth life. I struggle through each one. But, I can’t anymore. I climb onto the bed and the women around me hold me as I push. I trust when she tells me to push. I trust when she tells me to push down. I trust when she tells me not to be afraid. And then. Then she is here. “She’s healthy.” WHAT?? We had a girl? And then the tears come. The hyperventilating silence and awe. I am feeling her on my skin, breathing and looking up at me. When I think of how I might be as a mother, I hope that my daughter knows that she was raised collectively, and that she is a product of hundreds of years of resilience and strength that she might know in her lifetime, collective liberation. I hope that she knows the love of community and works for the good of the people. I pray that she will have a spirituality that connects her to God and all that is beloved. I hope that she stays connected to the earth and the water and loves to be in the water as much as she loves to splash around during bath time. I hope that she has passion for what she loves and uses her voice in the same way she takes her pacifier out to say what she wants to and then puts it back in by herself so that she can rest more easily. I pray that stay connected to her mother/father/parent figures so that they may give each other life. Midwifery Care deeply values the postpartum time period. We watch as new identities are forged and the relationship between babe and family forms. We also see the family begin a process of learning how to be in the world as a new unit. When talking with folks about midwifery care, I often get the question, "What do you do about postpartum?". When I clarify this question with them, I realize that they are referring to postpartum depression, rather than the period of time following birth. This is the most common reference that is made to the postpartum time period especially with folks who are not yet parents. It is true that depression and mood disorders can form in the postpartum period, sometimes seemingly out of nowhere. And it is also true that many families struggle with emotions around parenthood that don't seem 'acceptable' in society. When we look at the ways that our culture neglects caring for newly postpartum families, it is not surprising how common postpartum mood disorders are. We leave families unsupported, disconnected, and questioning how to fit in as their new selves. We ask them to reintegrate into a busy and unhealthy life style soon after birth, and imagine that their capacities for work will be the same while offering no space for their new identity to come out. We need more spaces where families can gather and share honestly about all the ways that parenthood can be hard and isolating, as well as empowering and enlivening. We need spaces where new parents are heard and held with love and compassion. Space for deep and honest connection is a missing ingredient in the postpartum time for many new families. While this will not be the only change necessary to better support new parents who are at risk for developing postpartum mood disorders, or struggling to integrate the less joyful experiences of parenthood, it is certainly a beneficial step. 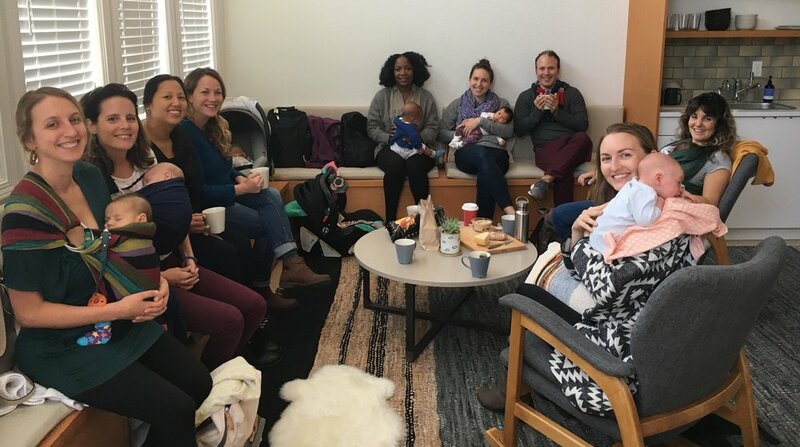 It has been such an honor to hold space for new families to come together through the Bay Area Homebirth Collective at Oakland Birth + Wellness. It is beautiful to watch families connect over struggles that they imagined were unique to them, and share anecdotes and lessons learned with each other. It is so important to know that we are not alone in this process. We will continue to host this group and welcome all postpartum families with babes in arms to come and participate. While we are not a group with a specific focus on working with postpartum mood disorders, we understand that this is a common experience for new families. If you feel that you need more individualized support, always reach out to your midwife or another supportive health care practitioner. Postpartum.net is a great place to start if you are lacking the resources to get started. I have to say I was not opposed to medication and or an epidural in any way. However, after meeting my midwife I suddenly found myself doing way more research around birth than I could have ever imagined. I was determined to work hard to make my birthing experience MY experience. Marea has always given me amazing bedside manner. I always felt like she legitimately cared about me, my unborn child, cared about meeting my husband, my step-kids and my closest friends. I was always free to ask as many questions at our hour+ appointments. When I started pushing, my midwife was concerned that the baby’s heart rate was dropping with the contractions. She monitored for a while, and had me try some different positions to see if that helped the baby. After a while, she very calmly looked at me and told me she was going to call an ambulance to transfer me to hospital. Although for a second I felt like I failed, I knew she was doing the right thing. Yes of course I envisioned my perfect water birth, the flower petals and the essential oils, the perfect playlist and the birth of my baby on video. But at the moment the best I could do was take the words of affirmation I had previously taped in my bathroom along the ride with me. Being inside an ambulance going so fast down the hill can be nerve racking, but I remember constantly looking into my midwife's eyes to find reassurance once again. Never once did she worry me. Once we arrived at Highland Hospital everything happened so fast. It felt pre-meditated. Within a couple of hours I held Colette in my arms. I did it. I really did it! When asked I always say I couldn't have asked for a better birth story. I still don't think it was bad at all. My midwife gave me positivity, she prepared me fully for this day. I most definitely could not have done it without her. I would have been just another number, numbed from the waist down. I thank her and my support team very much. I encourage everyone to “feel” what its truly like to give birth. Feel it!!! I did and I have zero regrets. Part of me was hiding. Not all of me; Jemima’s birth was amazing, and I only came away from it strengthened and empowered and fuller – more myself than I’d ever been before. But there were still those niggling doubts and flutters of nervousness that are always present when something difficult looms. Birth is transforming. And being transformed requires undergoing enough depth of experience to be forever changed. Change is hard, and so is birth. So part of me hid. But you can’t hide forever. On Saturday I told my mom that I thought tomorrow (Sunday) would be the day it all happened. I knew I was stalling, and had mentally held it off as long as I could, but on Saturday I felt like it was time to allow my baby to come and my body to work beautifully with her to make it happen. I went to bed on Saturday night, and things started Sunday morning. It came a lot like it did last time. Birthing waves woke me periodically in the night, but this time I decided to ignore them. “If I’m going to give birth, I’m going to do it tomorrow when I’m awake!” I told myself. And then I’d go back to sleep. My attitude about this birth felt different. I was trying to accept what the birthing process would bring me, but I wanted some things to be different this time, and I felt like to some extent making changes would be up to me. Chase came in to kiss me goodbye and head off to his meetings, and I told him briefly that I’d been having waves for a while. He seemed surprised, asked me if I wanted him to stay, and I said no. “We’ll see how things progress, and what happens,” I said. He agreed, told me he was proud of me for being calm, asked me to keep in touch, and left. Mom and I got breakfast for Jemima, and started the day normally. Sometimes I would pause for a wave, sometimes I would go lay down and turn off, and things stayed about 15 minutes apart. Mom and I straightened a little, thinking that if this was the day, it would be better if the house was clean, and decided that we would still go to church. Chase came home and I told him that things had stayed consistent, but we were still going to church. He was a little surprised, but totally supportive. I think I was in denial a little bit that this could really be happening, and pretending it wasn’t happening was the first way I decided to cope. My waves felt manageable, and I continued to pretend that everything was normal. We got to church and I had waves consistently through sacrament meeting. I would turn off for each wave and close my eyes and relax into my oblivion. Every time this happened I could feel the intensity of Chase’s gaze from the stand. After the wave would pass, I would open my eyes to find his boring into mine. Even from across the room I could feel his support and strength. He is always there every step of the way. About halfway through the meeting it hit me like a train. I realized that I was literally going to have this baby today. I just knew. A thousand thoughts streamed through my mind, twisting and twining – colors and smells and plans and doubts and second guesses…flashes of moments and memories and excitement and fear. The emotional culmination of nine months of waiting is hard to process. It’s the beginning of the end and the beginning of the real beginning. That moment of realization holds more emotions than I feel like my body can process or contain without bursting. Once my mental storm cleared a little, I realized that my foremost feeling was an almost maniacal need to sleep. I knew the time when sleep was possible would be limited, and that no matter how long this went, I would surely need it. So I started watching the clock. That was seriously the longest meeting of my life. Chase raced to my side the minute it was over. I’m sure my eyes had already told him everything he needed to know, but I quietly informed him I was leaving to rest because this was really happening. The excitement and anticipation between us was palpable. He asked me more detailed questions about what I was feeling, and agreed that rest was the best choice right now. Then he walked me home, tucked me in, and left. I got two blissful hours of sleep, and it felt like heaven. Everyone came home, and we decided it was time to evaluate: my waves were still consistent, they were getting stronger, but weren’t super close yet. Ok. So we decided to keep going about our day and make dinner. I helped, but would head out to the couch and turn off whenever a wave came. Dinner was good, and we were eating and laughing when I suddenly had a few waves fairly close together. The tone changed a little, and we decided it was time to call Renee and chat about what was going on. I didn’t want to talk on the phone, so Chase and Mom talked. Mom came back and told me that Renee wanted to come and observe me and check in. For some reason that made me feel really nervous. I felt stupid saying no, and I couldn’t actually pinpoint a reason why that wouldn’t be ok, (except that maybe it made things feel more real) so I said that was fine. At this point it all broke over me, and I became emotional. I was kneeling by the couch having a wave, and Jemima came over and gently started rubbing my back. I looked at her sweet little face and realized that it was the last night I would be only HER mommy. From now on and forever, I would always be shared. I started to cry. I needed to mourn that loss like I never had before. Welcoming our sweet Lavinia would be so joyous, but with change always comes the loss of how things were, and would never be again. Jemima, my firstborn, my sweet, tender girl, the baby that made me a mother – our time alone together was going to be over in just a few hours. How had it ended so quickly? Where had the time gone? I held on to her, and that moment, and cried. I asked Chase to call Mel. She would be photographing our birth, and although things weren’t really serious yet, it was getting close to Jemima’s bedtime and I wanted her in some of the pictures, since I was sure she would be sleeping when the time came. I decided to change. It felt like time to accept more of what was coming, to shed my normal clothes and don something more suited to this time. A uniform, a suit of armor – to become who and what I needed to be during birthing time: instinctual, primal, strong, grounded…ready to fight and win and pass through to the other side of this experience. I put on a super comfy sports bra I had purchased just for this occasion, and my favorite yoga pants. I still remember that my mom came in just after I had changed and said with a catch in her voice, “Honey, you look so beautiful.” I was surprised; with that huge belly and those swollen feet it had been so long since I’d felt pretty. But on this night it wasn’t the beauty of makeup and perfectly fitting clothes and curled hair that mattered, it was the beauty of stretch marks and pulled back hair, an enormous belly and yoga pants, and the amazing, volcanic miracle my body was about to perform as I brought forth life. And that is beautiful. The midwives arrived and for some reason I couldn’t pinpoint my feelings. I was a jumble of nervousness and shyness and…I don’t know…confusion? Maybe torn between how I thought I should feel and how I actually DID feel. I knew this was how it would be, but it was like I didn’t know how to proceed ahead while I was being watched. Renee brought and exuded the calming presence I so adore about her. She asked how I was doing, and we talked things over while I sat on the ball. She listened to Lavinia’s heart and they started filling the tub. I felt a fearful fascination as I watched. The tub drew my eyes again and again, but for some reason I skirted around it when I walked, and tried to avoid looking at it. It represented the climax, the culmination of all of this, and even though giving birth in the tub was exactly what I wanted, for some reason it was the elephant in the room. It was the reminder that this was really really going to happen, and that I was still not ready. I looked around the living room with the filled tub and the midwives busily setting up their stuff, and it felt too real, so I retreated. I ran away to my room. Mel came and took pictures of us on the bed. Jemima was so sweet, rubbing my back with Chase and quietly taking it all in. I was trying to relax deeply, and loved being surrounded by my little family. But when it was bedtime, I got up. I wanted to put Mima to bed myself on this last night before everything changed. I rocked Jemima and read her books and cried the whole time. I ignored my waves and tried to give everything of myself to Jemima this one last time. She was tender and sweet and would wipe my tears and snuggle closer. I held on to every moment. Change was coming so fast and all of the sudden I didn’t know anymore: were we ready? After a hundred tears, and even more hugs and kisses, I left her room to let Chase finish. I stepped out into the living room and Esther asked me, “Are you ready now? I feel like that’s what you were waiting for.” In a wave of realization I knew she was partially right. “Yes,” I said. I needed to love and snuggle and give everything to Jemima one more time, and then let go of the life we had. But now that I had done that, I could give everything for Lavinia, and accept the new family we would be. The scene that waited for me in the living room still felt overwhelming. I remember Renee asking me if I felt like a watched pot. I laughed it off and said I didn’t think so, but I should have been honest. I was trying so hard to act like none of this was fazing me, hoping that by projecting confidence my fears would disappear. But my fears won out, and I ran away to my room again. I told everyone I wanted to be alone with Chase, and they agreed that I should sleep if I could. The next few hours are a blur of hypnosis CDs, gentle check-ins by the midwives, Chase’s support, and strong birthing waves in the darkness. It was getting harder and harder to run away in the face of the ever-increasing wave intensity, so I started mentally running away. After every wave I would tell myself, “That was strong, but it’s not happening yet, so I am going to sleep.” I would doze off between each wave and repeat the process the next time. At one point Renee came in to check how things were going, and she stayed for a while, asking me to let her know every time a wave came. They were getting stronger, but she was checking length between waves, which was staying fairly consistent, and I think she was trying to gauge whether or not this was going anywhere. Chase, as always, was my rock. Every wave he was there; strong, supportive, touching me in whatever way was helpful, talking me through this, and laying next to me while I dozed between waves. After a few hours, I stopped sleeping between waves, and started thinking. I thought about my fears, my worries, my deepest secret concerns that I was hiding…and hiding from. I went round and round in mental circles until I knew that something had to change. Something had to happen to free me from my mind game. I needed help. I sat straight up in the darkness and asked Chase to go get my mom. She quietly came in and knelt next to me. The words started gushing out. “I...I think I’m scared. Or nervous? Or…I haven’t let go of my fears, and they’re keeping me from letting this go anywhere. I’m stopping it! I don’t know how to release, to let go.” I cried and tried to explain what I still didn’t quite understand myself. My mom is amazing. Always. And just like she always does, she knew what to say. She told me it was ok. All of it. She comforted me and talked to me for a while, but what I remember most was when she suggested Chase and I go for a walk. I latched on to the idea and nothing has ever sounded so heavenly. “Yes,” I said, “I want to go for a walk.” It felt like a lifeline, an escape. I wanted to run away from this bed that had been changed to have the birthing sheets on it, and the midwives waiting for me to give birth in the living room, and the birthing tub that simultaneously fascinated and terrified me. I had arranged everything to be exactly the way I wanted it, but because I hadn’t faced my fears yet, I wasn’t ready for any of it. I threw on a shirt and Chase and I left. I knew I was running away, but I didn’t care. It was midnight, and I’ve never seen such a beautiful night. Chase and I both agreed it felt like that night was made for us. It was balmy and still and some delicious temperature that made it feel like my skin was being caressed, but it was never cool or warm. It was perfect. I’ve never felt air like that before. Suddenly I felt lighthearted. We strolled hand in hand and laughed. We chatted about random things, and heard people snoring through their windows, which made us laugh. I had to stop and work through a few waves while Chase leaned over and supported me, but they were infrequent, about 15 minutes apart. It felt so freeing to escape for a while. Maybe I’ll always need to run away for a bit during my births. We walked and talked and soaked in the beauty of that night, until I started to feel the weight of what was waiting for me back at the apartment begin to press down on me again. I had another wave, slightly stronger, and told Chase I wanted to walk a little bit more. My waves were getting farther apart, and I knew it was time to decide. We slowed by a tree that faces the balcony of our apartment. I could see inside. My heart started racing. I asked Chase to give me a minute alone, but stay where I could see him. Always supportive and sweet, he told me he would do whatever I needed, squeezed my hand and moved a little ways up the path. I stood there and looked up at that tree, and cried. “How do I do this?” I asked myself. “How do I let go?” I suddenly felt an urge to do something symbolic, anything that could help me process these feelings and release them. My thoughts jumped from one thing to another: “I could improv right here…I could try and dance it out.” Movement was always so cathartic, but with my body feeling so big and awkward, and a little sore because of birthing waves, I discarded that idea pretty quickly. I cast about for other ideas and then I knew exactly what I needed to do. I looked around me, and saw a bunch of pine needles on the ground. I carefully selected a few, and held them in my hand. Tears ran down my face as I picked one and whispered, “This one represents how scared I am that this birth could go as long as my last one did.” I grabbed another one. 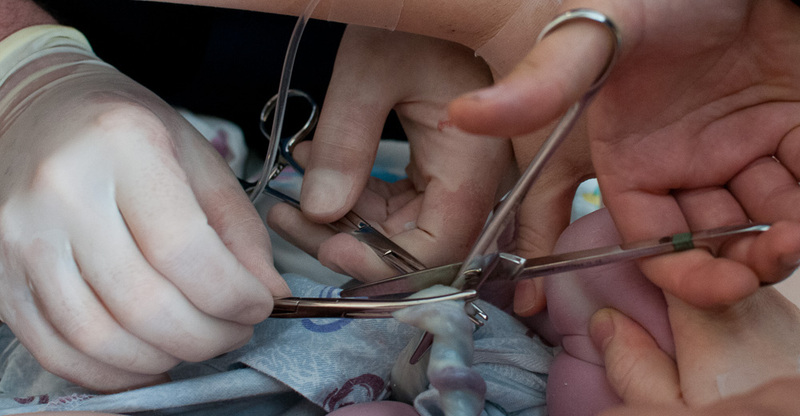 “This one,” I said, “is my fear about the pain of birth.” I held up the last one. “And this one,” I whispered, “is my fears about how hard it is to care for a newborn and never sleep.” I held the needles tightly in my hand and trembled and cried in the shadow of that tree. I knew what I had to do but I still wasn’t sure I could do it. I walked to Chase and reached for his hand. I held up my pine needles, and sobbed, “These are my fears.” He searched my face and nodded. “And…I need you to watch me let them go.” He gripped my hand. "Ok honey." I could feel his support, tangibly strengthening me at this crossroad. I cried harder than ever, clutching my needles tighter and tighter. It’s terrifying to let go of fear. Fears are comfortable in a way. They give us something to hide behind. Our fears keep us from doing the only things that are more terrifying than fear: the things that could show us how powerful we are. I knew that I had to really, REALLY mean it when I let those needles go. I truly had to let my fears evaporate, because something else was more important than hiding. I had to strip my soul of all the fear I harbored so I could move forward. I stood there for a while, crying, holding onto Chase, and gripping my pine needles. A battle was being waged inside of me; my fears grappled with my hopes – my hope that this birth could be different, shorter. My weakness attacked my strength – the strength that told me that I had done this before and could do it again. My desire for control sought to overpower the necessity of letting go and stepping into the unknown. While my mind screamed all of the reasons why it was logical to want to run from this, something deeper tugged at my heart, begging me to accept that I could not control how long this labor went, or the pain involved, or how much this baby would sleep, and that that could be ok. And that I could be strong enough and brave enough to embrace and face it. I waffled back and forth, back and forth. I felt everything within me reach a climax of so much emotion I thought I would burst, and I let go. I still vividly remember the feeling as I uncurled my fingers and let those pine needles fall to the ground in front of me. I had done it. It was over. I leaned into Chase and he held me and whispered words of encouragement and love while I cried. It felt like a sacred moment; my experience had hallowed the spot where something so cleansing had taken place. After a bit I eased away and felt profound peace and strength fill me. “Ok.” I said. “I’m ready.” He wiped away my last tears, told me he loved me, and we walked away hand in hand. Whole. It was such a perfect way to put it. Yes, I finally did feel whole, not broken into pieces and sections anymore. No more confidence cracked by fear, or a calm visage hiding a circular gauntlet of questions and control issues. I was one. Whole. Ready. And not just ready to accept this, but to grab this with both hands and DO it. I smiled through my tears. “Yes,” I said. We hugged while Renee checked in with Chase about how my waves were progressing. Still pretty far apart, farther than they had been, actually. She asked how I felt about her leaving. I felt great about it. I wanted to be alone with mom and Chase and this heady, newfound feeling of strength that made me feel powerful. Renee suggested I eat something and left. It was one in the morning. I grabbed some cereal and we all went to my room and I ate while we talked. We told mom what had happened outside, and I couldn’t believe how lighthearted and relaxed I felt. We were laughing and joking and then a wave came. I decided to change how I was approaching this. No more laying on the bed trying to relax, or breathing through them on the ball. I had truly and honestly released all my fears relating to this birth, and this feeling of fearlessness gave me this desire to push through and finish this on my terms. I turned to my instincts. I hopped off the bed and knelt really low on the ground. I told Chase to lay on the bed and hold my hands. I pulled on him through the wave, and made whatever sounds felt natural and good. When it was over, I stood up, and sat back down on the bed. I resumed my cereal eating, and within a couple minutes was back down in my kneeling position. I was pulling on Chase and mom was at my back. This happened a few times in succession, and happened so quickly that I was about two-thirds of the way through my cereal when I told Chase I didn’t want any more. I remember Mom saying that the fact that I didn’t want to finish my food told its own story. About two quick, STRONG waves later my mom said, “I hate to sound like a broken record, but do you think we should call the midwife?” I agreed. I didn’t feel nervous about her being here anymore. I was ready to do this, and she should definitely be here when it all reached the crescendo. Things were going fast. My waves were speeding up, just a couple minutes apart, and were back-breakingly strong. Every wave was stronger than the last. But I didn’t shrink from them. This was what I wanted, to take charge and change things. I didn’t want to have a 36-hour birth again. I was conquering my first fear. I love ocean imagery when it comes to birth. I feel like during Jemima’s birth I was calm, accepting, waiting. I envisioned myself sitting on the beach and letting the tide gradually come in, cover me, and take me out with it to the deep waters of birth. With Lavinia’s birth, I feel like I was naked and running head-first into a tidal wave. I had mentally ripped off everything that could come between me and this experience, and although this time I knew how deep and turbulent the water would be, I was unwilling to wait for it to carry me away. I would run out to meet it. With this image in my head, I pushed mentally and physically into my waves. They came faster and faster and I welcomed them and worked with them. I was moving a lot and my feet were going crazy! I was pulling on Chase and slapping my feet against the floor. For some reason having every bit of me reacting to the pressure felt good. At one point I rocked back on my heels and panting, asked my mom, “Does this look like transition to you?” She said it looked like very active birthing time, and was maybe even close to transition. I was glad. I was throwing myself at this, racing for the finish. Every wave I pulled on Chase – his shirt, his neck, his hands. It was so intense and so all-encompassing and I was being pulled and thrashed by this tidal wave of birth, but I kept pushing back. Renee showed up, she said she had gotten home and just crawled into bed when we called. She couldn’t believe how quickly things had changed. She started getting everything prepped for birth. It felt like a huge step, but I told her I wanted to get in the tub. It had been waiting for me and now I was ready. I was surprised at how warm the water felt, and how good it felt on that summer night. But it did. The warmth did wonders on my back, and helped me relax. Like I had in the bedroom, I had Chase stay up by my head. I was pulling and yanking on him like crazy, but the movement was what I needed and he didn’t complain. My hands were fisted on the front of his shirt, and I would pull him towards me, and push him away, again and again and again. The sliver of my brain that was still functioning normally registered how hilarious it was to see him being throttled while trying to comfort and support me. Back and forth back and forth - but the intensity was crazy; even with all that Jemima’s birth had been, I had never felt intensity like this. I needed the movement. I continued to push back, to rush into it all, instead of shrinking away. The intensity was consuming me as things progressed rapidly, and I began being very vocal. Chase asked if I wanted Mel there. I must have agreed because she came soon after. Mom poured water on my back, and I felt like I was going to die whenever she had to stop and refill. Mel came, I heard her voice, and I registered her movement around me. My eyes were clamped shut, and I started saying, “It’s so hard! It’s SO hard!” Over and over and over again. Everyone validated me repeatedly. But none of it really reached me until I heard Mel say quietly to my right, “It is hard. It is so hard.” For some reason that helped. I appreciated everyone’s support, but for some reason Mel’s words penetrated my thoughts like no one else’s had. Her words brought calm. I continued to pummel Chase over the edge of the tub, when things reached a peak. I started pushing. “I’m pushing!” I yelled through gritted teeth, “I’m pushing! Is that ok? !” “Do whatever your body tells you to do.” Renee said calmly. Sometimes amidst the vulnerability of birth, I think I am looking for affirmation that taking the next step is ok, and that was all I needed to hear. I pushed. And just like last time, I felt like I would explode into a million pieces from the pressure. But I didn’t hide. I didn’t stop. All of the sudden I felt like I lost control as my body took over and ran away from me, faster than I could go. Waves were crashing upon waves with no room to breathe in between. I was vocalizing and pushing and my noises would go on forever, and I heard mom say, “Breathe -BREATHE!” When I finally caught my breath I said, “I can’t! It’s not me! I can’t control it!” I had run far enough into my tidal wave that it swept my feet out from under me and took control. My body was pushing without my help, and I felt like I was just bobbing in the water trying to find my footing. I screamed and was so loud that in the back of my mind I thought, “Wow. That is really loud. I think the screen door is still open. Hm.” I felt Lavinia move down, crown, and her head start to come out, and it was a climax of pressure and feeling and opening that is awe-inspiring and unbelievable. I thrashed and trembled and pushed and pushed. Her head came out. I thought I would burst…one last push and her body was born. I collapsed against the side of the tub panting, crying – it was over. Time stopped for a moment. Sudden relief from such extreme pressure is hard to process. It’s like waking up in the middle of a dream – it’s jarring, disorienting. I took a breath as everyone helped me turn over, and Renee placed Lavinia on my chest. The turbulence had subsided, and we were surrounded by calm water. I held her, and felt her slippery warmth as we breathed together. New life had been born, and a mother reborn. I had experienced power and cleansing in that tub - a baptism of fire and water and spirit - and I was changed forever. Transformed and made new. I had given everything, including my fears, and I made it. I conquered. We had crossed over to the other side and she was in my arms. *Note: The mind/body connection is amazing, and I think Lavinia’s birth demonstrates the power of that connection. Things stayed fairly consistent for 18-20 hours, but after I released my pine needles and my fears, things escalated quickly and she was born four hours later. We don’t do vaginal checks, but if I had to guess I would say I was at about 3-4 centimeters when that happened, and that I traveled through the rest of dilation, transition, and pushing in that small time span. It’s incredible how interconnected our bodies and emotions and minds are!